Basketball Hall of Famer Charles Barkley has gained 100 pounds since retiring from the NBA in 2000. "Things have gotten out of hand," said Barkley, who is a studio analyst for Turner Network Television's NBA coverage. "I've always joked and complained about my home state of Alabama of being fat. Well, I forgot that I was fat." 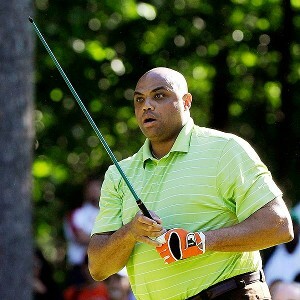 Stan Badz/PGA TOUR Charles Barkley ballooned up to 350 pounds and is now working on slimming back down. So Barkley, on Tuesday morning, will be announced as the ambassador for the new Weight Watchers for Men campain. He will appear in print, broadcast and online marketing beginning Dec. 25 as part of the new "Lose Like a Man" program. Barkley, who started the program about two months ago, has lost 26 pounds already and is committed to losing a lot of weight. "I don't think it's realistic to get back to my playing weight of 250 pounds," said the 48-year-old Barkley, who was nicknamed "Round Mound of Rebound" while playing at Auburn before 16 years in the NBA. "I just need to get healthier and hopefully help others get healthier. That's my real goal." According to the Centers for Disease Control and Prevention, 72.3 percent of U.S. men and 64.1 percent of women are overweight or obese. Men often are overlooked by the weight loss industry, so Weight Watchers made a commitment to help men. "You can't give fat people small meals and think they'll stick to the plan," said Barkley, who has thrown in some exercise to complement the diet. "I had to learn how to change my eating habits. Let's be real: You see anyone who gets fat eating fruits and vegetables? So I'm starting to eat more of them now!"